3/18/15 UPDATE: Click here for a printable version of our regional compensation analysis. It is clear that our teachers deserve a significant raise. 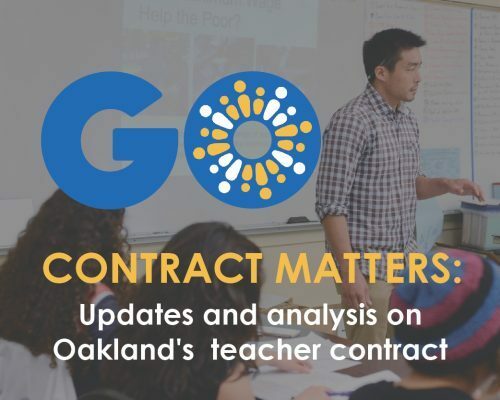 Both the Oakland Unified School District (OUSD) and the Oakland Education Association (OEA – the teachers union) have proposed double-digit raises for teachers, but there are key timing and size differences between the two offers. Click on the image or click here to see the full summary of the two offers. Nerdy methodology note: All information in this post was gathered from a) individual districts’ most recent salary schedules (typically 2014-15) or b) 2013-14 J-90 forms (titled “2013-14 Salary and Benefit Schedule for the Certificated Bargaining Unit”) submitted to the California Dept. of Education. Our regional analysis builds on information originally provided by the OEA. We appreciate them for sharing their analysis with us and the broader Oakland community. There are 16 unified school districts in Alameda County. These are the districts with which we compete for teachers. Of the 16 districts, five do not offer any benefits packages. Usually, this is in exchange for higher teacher salaries (i.e., teachers in these districts receive higher salaries, but have to purchase their own insurance). 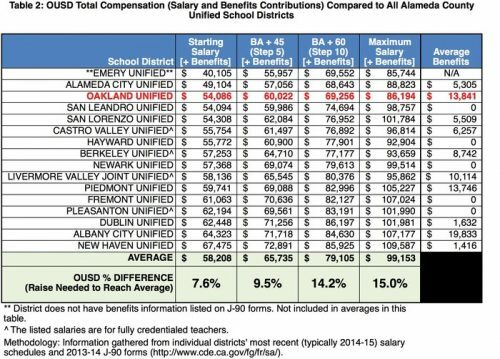 Because of this, it is hard to compare OUSD’s salary alone with these districts because the teachers are not being compensated in the same way. 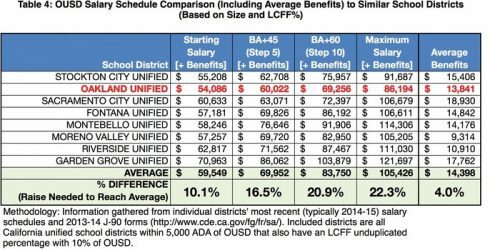 We should be clear that we believe that OUSD teachers should not be penalized for their benefits package, but it is important to recognize that the money spent on these benefits is a key form of compensation. Therefore, we create two separate comparisons: (1) comparing districts that use benefits as a part of teacher compensation; and (2) comparing all districts based on total compensation. See the charts below for the full comparison. 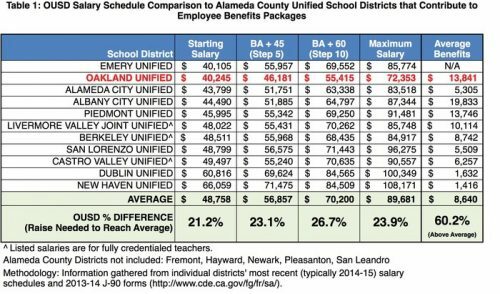 Districts not included in Table 1 (because of a lack of benefits contributions) are Fremont Unified, Hayward Unified, Newark Unified, Pleasanton Unified, and San Leandro Unified. Dublin Unified only pays for dental insurance. New Haven Unified contributes $1,400 per employee for benefits with the employee covering the rest of the cost. For the rest of the districts, there are differences in terms of the quality of the plans and the amount employees must contribute. Here are the salaries from the five districts that do not include any benefits package. You can see that as a group, they are higher than those that include a benefits package. In Table 2, we compare total compensation. You can see that OUSD is still below that regional average, though closer than in the first comparison. We include all districts in this comparison because districts that do not offer benefits are generally giving higher wages in place of a benefits package. SIMILAR SCHOOL DISTRICT ANALYSIS: What about other districts more like Oakland? Oakland has challenges that other Alameda County districts do not. Oakland is both the largest district in Alameda County and has the largest “unduplicated LCFF percentage” (78%), which includes English learners, low-income youth, and foster youth. We tried to address the question of whether OUSD’s teacher salaries are low because of these challenges. 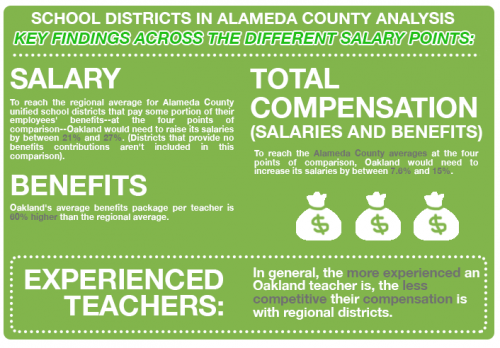 To understand how these unique circumstances could affect Oakland teacher salaries, we compared OUSD to seven California districts that are similar in both size (within 5000 average daily attendance) and student composition (within 10% LCFF unduplicated percentage). 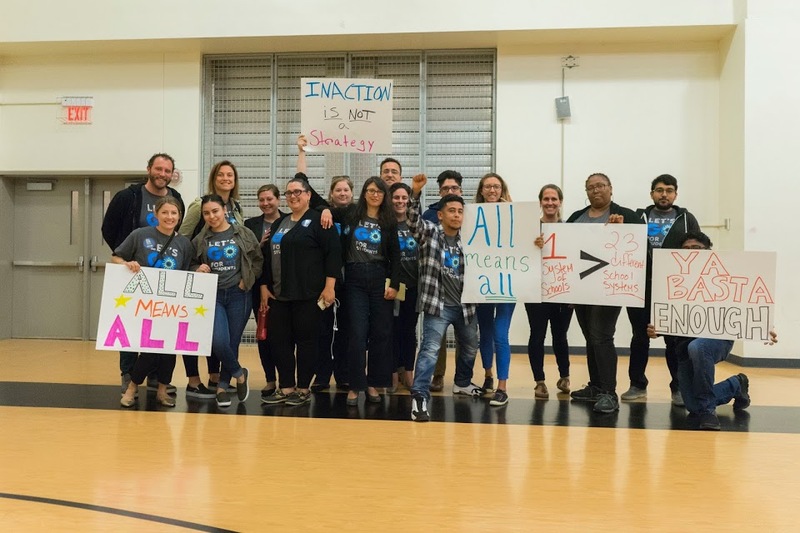 These districts include Fontana Unified, Garden Grove Unified, Montebello Unified, Moreno Valley Unified, Riverside Unified, Sacramento City Unified, and Stockton City Unified.